The elderly often experience loss of muscle tone and control and dementia causes changes in judgment. The combination of physical and neurological impairments creates cause for concern among Oshkosh caregivers and warrants a full evaluation of home safety. Read on for some practical ways to make the home setting a safer one for your senior loved one. Evaluate how easily your loved one can access the basement or any other level changes that include steep stairways. It is important to limit access to sharply sloped stairways due to potential hazardous fall situations. Consider installing locks, doorway gates, or even half doors. Poor lighting can also lead to falls. Use night-lights in your loved ones sleeping area and also in hallways and bathrooms. Be sure to keep up with replacing worn out bulbs. If the constant light seems to disrupt your loved ones sleep patterns, consider switching to motion sensor lights that come on as needed. Also be sure that his or her glasses are always available and that eye exams are up to date. It is advisable to keep an extra pair of glasses on hand to ensure your loved one can see where he or she is going. The slippery conditions that exist during bathing make fall risks a reality. Don’t rely on your own strength or existing towel bars to catch your loved one should he or she lose balance. The Alzheimer’s Association points out that bath time resistance is often a common aspect of dementia, which makes the bathroom an even riskier location. Place non-skid mats in the shower and install grab bars around the tub and toilet areas. 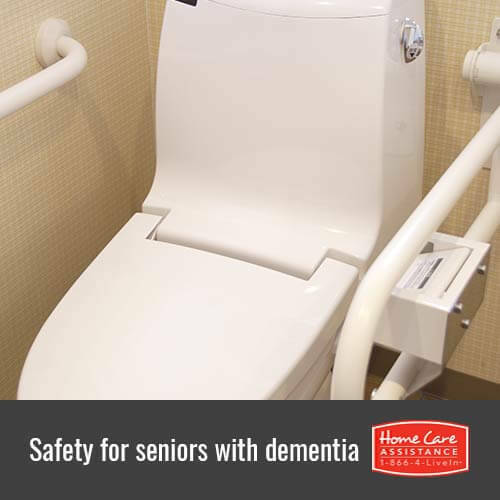 It’s also important for Oshkosh home care providers to accompany seniors with dementia when they use the bathroom. If your loved one seems too forgetful to use the stove alone, make sure that you or an Oshkosh dementia home care provider handles meal preparations or at least supervises them. This will prevent possible fires or accidental burns. Large, easy-to-read signs posted in the kitchen can prove helpful when remembering to turn off the stove and oven can protect your loved one, as well. Remaining at home as long as possible is a desirable choice for most elderly people with dementia. There are many sensible ways to increase home safety and maintain comfort and dignity in the home, especially when you turn to Home Care Assistance of Oshkosh. We are a trusted provider of dementia and Alzheimer’s home care that enables seniors with cognitive disorders to live at home while maintaining as much independence as possible. Our highly trained caregivers offer emotional support, cognitive stimulation, and personal care assistance to enhance your loved one’s time at home. Give your loved one the care he or she deserves by calling (920) 710-2273 and scheduling a no-obligation consultation today. How Can Family Caregivers Care for a Senior with Dementia?